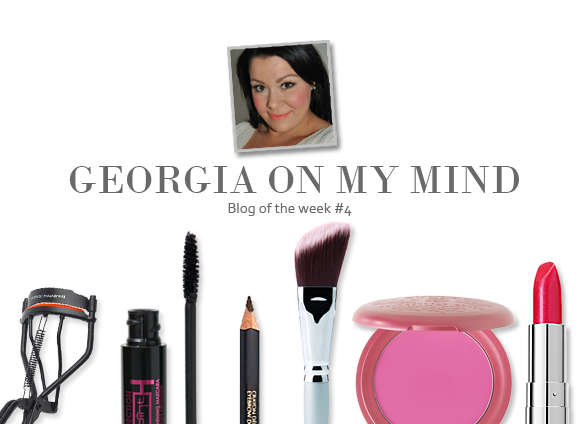 Our fourth blog of the week is a tribute to a fellow South Walian: Georgia on my Mind’s gorgeous Georgia, a mum who loves to talk cosmetics. As long-time readers of her blog, we were struck by the fact that she is truly passionate about every aspect of beauty; from talking to the SAs and MUAs on the counters, to discovering new products via other beauty bloggers, to creating new looks and asking for advice and opinions. It’s not a private hobby for Georgia but a sociable one – and this really shines in her impartial and detailed reviews. Sometimes what we really want is for someone to be straight about the things that they’re trying, and with Georgia you get just that. As she buys the products herself, you can be sure that she’ll turn the product inside out to find its worth, both for herself and for her audience. Before and after photos, extended trial times, decisiveness and honesty… which each and every review, you find yourself falling for or thinking twice about the product right alongside her. A cosmetics fan through and through, her insightful reviews keep us coming back for more week after week. Though we may be biased in the fact that we grin like a fangirl every time Cardiff is mentioned! She’s a complete gem, and an asset to the beauty blogging community. Georgia has a new home at Georgia on my Mind – go visit her! This entry was posted on Friday, January 28th, 2011 at 9:01 am and is filed under Blog of the Week. You can follow any responses to this entry through the RSS 2.0 feed. You can skip to the end and leave a response. Pinging is currently not allowed.